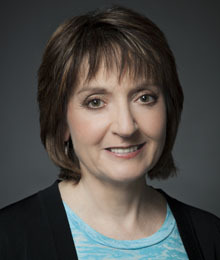 Helen Mayberg, MD, is professor of psychiatry, neurology and radiology. Helen Mayberg, MD, was the recipient of a Robert J. and Claire Pasarow Foundation Award at a special event on May 10 for her contributions to the field of neuropsychiatry. Mayberg is professor of psychiatry, neurology and radiology, and the Dorothy C. Fuqua Chair in Psychiatric Imaging and Therapeutics at Emory University School of Medicine. The Pasarow awards were created in 1987 to honor extraordinary achievement, creativity and distinction in the areas of cancer, cardiovascular disease and neuropsychiatry. Mayberg leads a multidisciplinary research program, using neuroimaging to study brain mechanisms and treatment response for major depression. She pioneered the use of deep brain stimulation (DBS) for treatment-resistant depression, and continues to enrich the use of DBS through ongoing studies that provide psychotherapeutic rehabilitation tailored to the specific individual’s needs. In addition, Mayberg’s current projects include development of novel imaging biomarkers predictive of treatment response and optimal treatment selection for individual depressed patients at all stages of illness. "The Robert J. and Claire Pasarow Foundation is honored to have presented Dr. Helen Mayberg with the 25th Annual Award in Neuropsychiatry Research, along with her colleagues at Stanford, Drs. Karl Deisseroth and Carla Shatz," says Jack Barchas, MD, president of the Robert J. and Claire Pasarow Foundation, and chair and psychiatrist-in-chief, Weill Cornell Medical College/New York-Presbyterian Hospital. "The Scientific Board of the Foundation was unanimous in their decision to acknowledge Dr. Mayberg's groundbreaking research using functional neuroimaging to study neuropsychiatric disorders. She is one of the world's foremost authorities in this area." Mayberg is a board certified neurologist, trained at Columbia's Neurological Institute in New York, with fellowship training in nuclear medicine at Johns Hopkins. She received a BA in psychobiology from UCLA and an MD from University of Southern California. She is active in the Society for Neuroscience, the Organization for Human Brain Mapping, the American Neurological Association, the American College of Neuropsychopharmacology and the Society of Biology Psychiatry, where she is a past president. Additionally, Mayberg serves on a wide range of journal editorial and scientific advisory boards relevant to clinical and translational neuroscience. Among various honors, Mayberg is a member of the Institute of Medicine (IOM) and is the recipient of the Falcone Prize in Mood Disorders Research from NARSAD, the Arnold Pfeffer Prize from the NY Psychoanalytic Institute, the Raymond Adams Award from the American Neurological Association, the Roche-Nature Medicine Senior Award for Translational Neuroscience, and most recently, the Alexander Award in Psychiatry.